Rhode Island's Only Indigenous Museum Dedicated To Sharing Our Culture, Arts and History From A First Person Perspective. Tomaquag Museum Features An Extensive Collection and Archive That Focuses On Tribal Communities of Southern New England. Tomaquag Museum is open year round, public visits Wednesdays from 10 AM - 5 PM and Saturdays from 10 AM - 2 PM; private and group tours by appointment. Plan your visit or book a tour now! For admission, directions and other information, click on Plan Your visit. Tomaquag Museum offers group tours year round designed for adults and children from a variety of Indigenous perspectives, led by an Indigenous Educator. We have thousands of visitors annually from schools, universities, scouts, assisted living programs, corporations, and more. Each tour can be adjusted to your unique specifications. There is a minimum charge of $100 for all private and group tours and that allows you to bring up to 10 guests. Each additional guest is $10 each. For other tour offerings, please check out the program listings for adults and youth! Intern Sherente Harris giving a tour of The Pursuit of Happiness exhibit. Museum Educator Lynsea Montanari with a Children's Hour group. Tomaquag Museum can come to you! Our offsite programs have served hundreds of schools, libraries, universities, businesses, and more ever year! Our highly qualified staff offer a range of offsite presentations, trainings and workshops that can be adjusted to meet your needs. Bring the unique voice of our indigenous educators to your facility today. Clink the links below to learn more! Lorén Spears visits schools around southern New England. Tomaquag Museum at Brown University, one of our many partnerships. Tribal elder Tall Oak Weeden during the A.I.M talk. The Mission of the Tomaquag Museum is to Educate the Public and Promote Thoughtful Dialogue Regarding Indigenous History, Culture, Arts, Mother Earth and Connections to Native Issues of Today. Check Out The Following Educational Resources to Assist in Your Research, Curriculum Development, or Just to Learn More. A Great Source for Teachers, Homeschoolers, Students, and Researchers. Don't forget to check out our YouTube Page for additional information. A list of helpful educational resources vetted for diversity of content, accuracy, and cultural sensitivity. Belonging(s): “A close relationship among a group and personal or public effects”. Through this community blog, we strive to be inclusive by including the unique perspectives of staff, volunteers, interns, and experts. 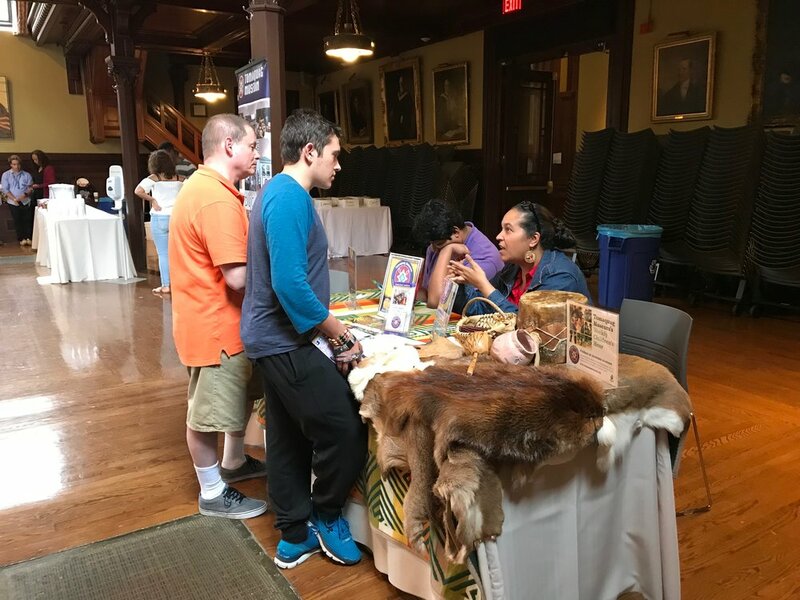 This video series explores a variety of different subjects around Indigenous life showcasing cultural presentations, guest lectures, Native American artists, Indigenous authors, and more! Tomaquag Museum welcomes all people to engage in our tours, programs, classes, workshops, lectures and demonstrations with artists, culture bearers and museum educators. We accommodate for special needs, all ages, and welcome all cultures to share in the dialogue and cultural experiences. Thawn Harris, Narragansett, leading a social dance during our annual Strawberry Thanksgiving celebration. Your support allows Tomaquag staff to create new tours, workshops, programs and lectures to inspire thoughtful dialogue and engaging learning experiences for all ages from pre-school to Elders. It allows for student interns to work in collections, archives, museum education and administration. Your investment in Tomaquag Museum supports job creation in RI, growing our economy. Our Indigenous Empowerment Network, aimed at rooting out poverty in Indigenous communities, creates educational and occupational opportunities spanning all generations from children to elders. AND most exciting of all, you will be supporting our new home development so we can continue to grow and serve the community. throughout New England. In 2018 we are celebrating our 60th anniversary! Be sure to visit us this year and help us celebrate this exciting milestone. in 2017 through our tours, events, and educational programs both here and throughout New England! in 2017, through private contributions from donors like you who have consistently supported our efforts, Kutaputush (Thank You)! "Wonderful museum! The tour was fantastic and an amazing experience. I would recommend to anyone looking for something interesting and informing. Don't be fooled by the small size, this museum is a must see!"